When I became a mother, I felt like I was giving so much of myself to my family that I often forget to pamper myself. As a woman, relaxing in the bath really gives me the time that I need to myself to be able to recharge and be able to focus on my family. I love to discover new bath products that let me transform an ordinary bath into a “spa experience.” EclipseSpa™ features Emerald Edition Bath products which are such a luxurious treat. I recently had the opportunity to indulge in the Emerald Edition Sugar Scrub scented with grapefruit essential oil. I selected the Grapefruit Emerald Edition Sugar Scrub because as a Floridian, the citrus aroma is really uplifting and even my husband commented on the wonderful scent. Just a small amount of the sugar scrub really reinvigorated my skin and my legs, arms, feet and hands were buttery smooth to the touch. The addition of shea butter and natural oils left my skin feeling super soft, moisturized and not a bit greasy or oily. I really appreciate that a little bit goes a very long way so you really get your monies worth with this product too. Have you ever used a bath bomb? Even though I had seen these before, I had never actually tried one and after my first luxurious bath bomb from EclipseSpa™ I realized what I have been missing all this time. 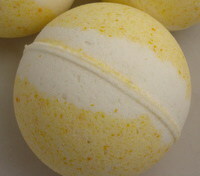 I tried the Citrus and Sage Bath Bomb and it was such a unique and relaxing experience. The first thing that I noticed was that this bath bomb looked much bigger than other brands that I have seen before and the scent of fresh citrus and sage was divine. Toss the bath bomb into a warm bath and it starts to fizz immediately from the baking soda and Epsom salts. I noticed that my muscles were not sore after this bath which I attribute to the wonderful power of Epsom salts (just my own personal opinion). EclipseSpa™ has a complete collection of luxurious yet affordable bath and body products that will turn your bath/shower into a “spa experience” while in the comfort of your home. You are invited by independent consultant, Michele Bodenheimer to purchase your favorite products by visiting the EclipseSpa™ website. I highly recommend the Emerald Edition Sugar Scrub and the Bath Bombs….go ahead and treat yourself to your favorites. You deserve it! Following Miki’s Hope on Networked Blogs. Voted for you on PFB 4/16!